Warm the Christmas pudding according to package instructions, then leave to cool to room temperature. Brush the pudding with some of the melted dark chocolate. Chill the remaining chocolate until slightly thickened and stiff but not completely set; it should have a glue-like consistency. Place the pudding on a stand or platter. 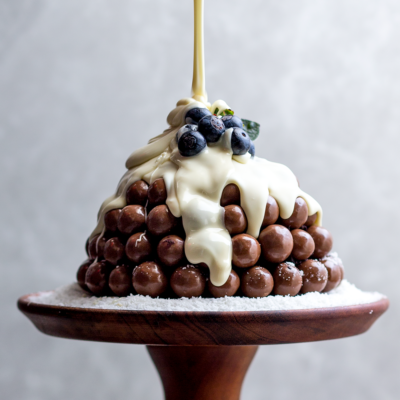 Dip a Chuckle into the cooled dark chocolate and press into the cake around the base. Repeat using the remaining Chuckles until you have covered the cake completely. Pour the melted white chocolate over the top of the pudding to recreate a snowy, ice-capped effect. Stud the top with fresh blueberries and chill to set. Cook's note: If you feel like going an extra mile, dip the Chuckles in Nutella rather than dark chocolate to stick them to the cake. Inspired! Browse more Christmas desserts here.